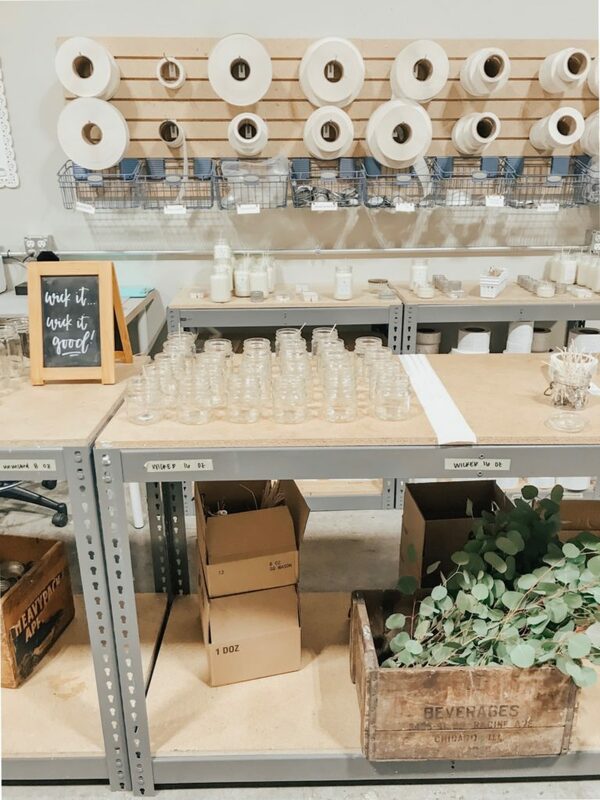 You guys, I don’t even know where to start this post because I feel like I have so much to say about my visit last week to Antique Candle Co. Seriously, it was AMAZING. 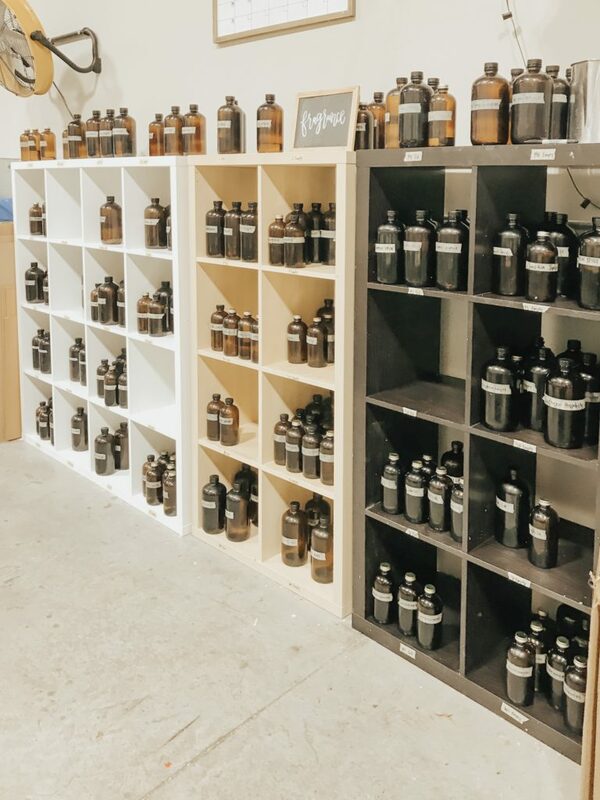 If you followed along over on IG stories you saw that I made the trip out to Indiana on Thursday and then Friday we had the opportunity to tour their entire shop, meet the team, and learn about how the candles are made. It was so inspiring and heart warming. And I’m sooooo happy I decided to break free from my homebody ways to make the trip happen. I took a ton of photos so I thought it would be fun to share them today! 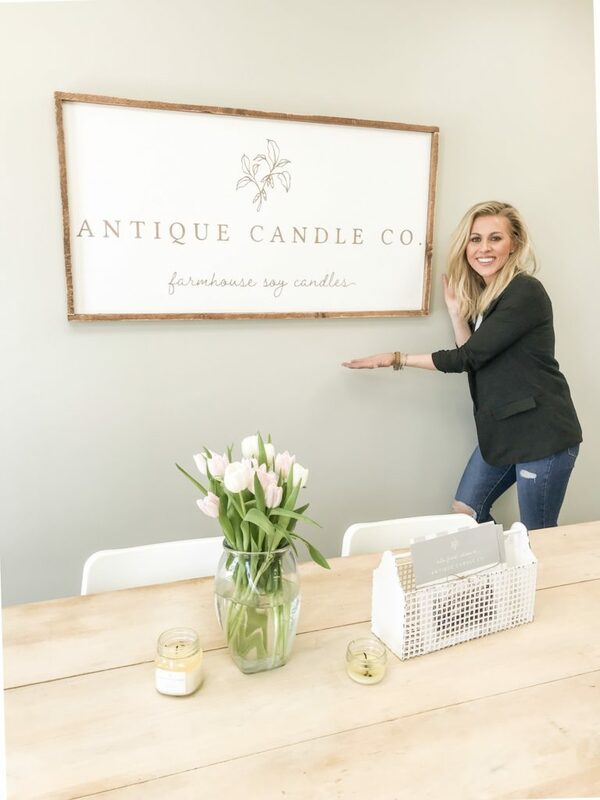 If you’ve been following along for a while now you know my obsession with Antique Candle Co started about two years ago. That’s around the time I first shared their candles here on the blog and since then I’ve been hooked. It’s truly the most amazing company and I’m just honored to share their work with all of you. They are based in Lafayette, Indiana, where they have the CUTEST little shop. When we walked it I literally said, “it smells like heaven in here!” because it really does. It’s the best smelling place in all the land. 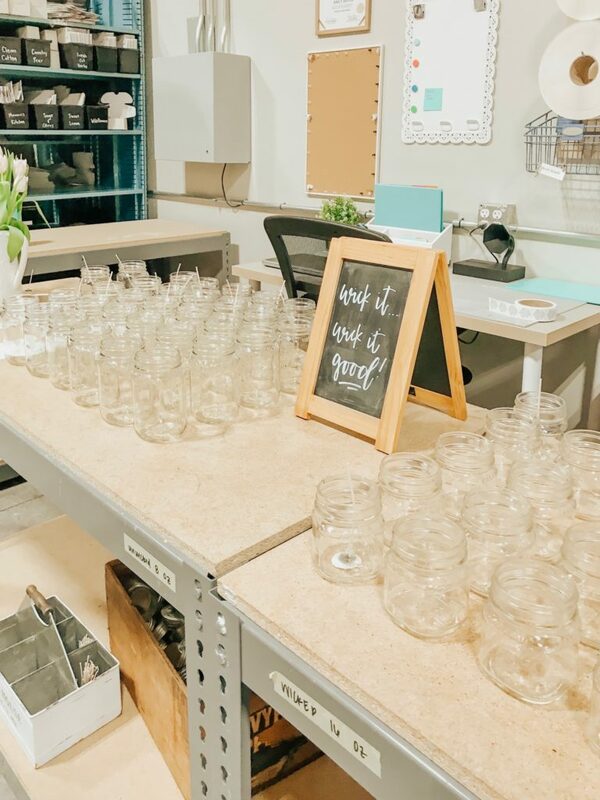 We started by meeting the entire candle team and learning a little about the history of the company. 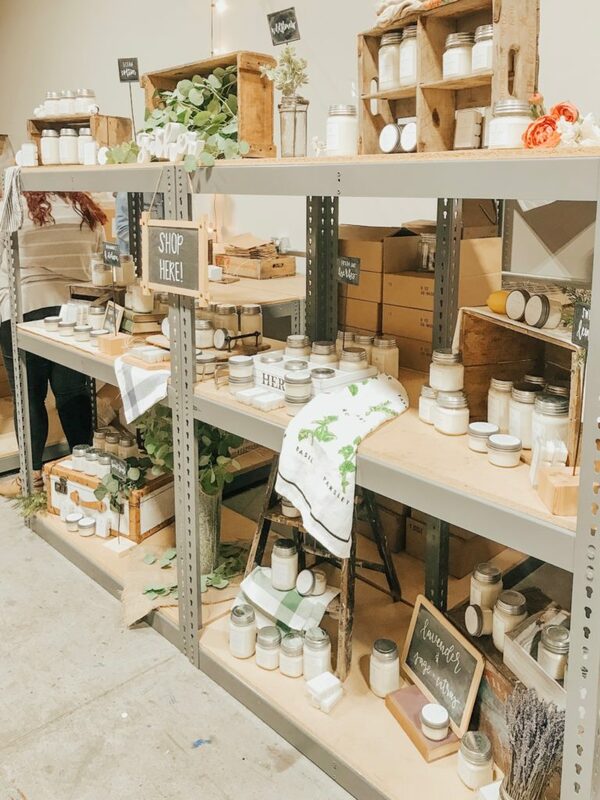 It was so great to hear about how this little business was started by the owner, Brittany, when she only had $200 in candle making supplies and a dream. 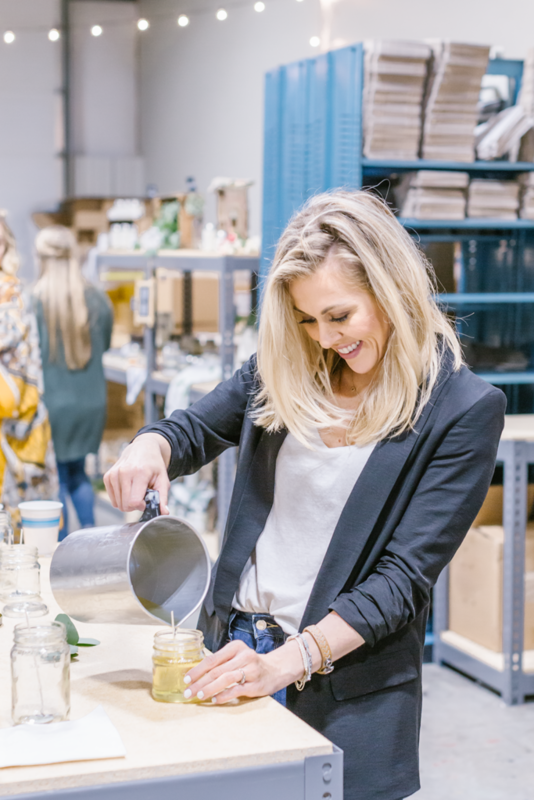 She worked so hard to make her dreams come true and this sweet company has flourished because of it over these past few years. 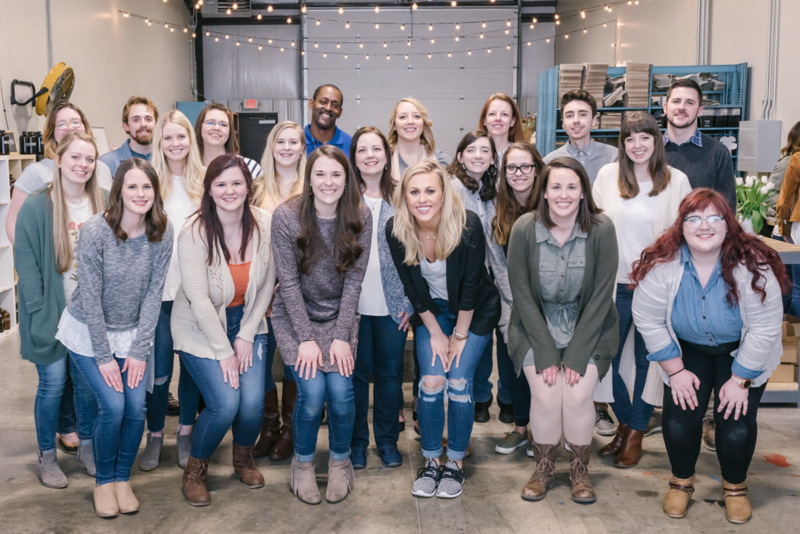 They now have 32 employees! After introductions we got to see tour the shop and see how the candles are made. 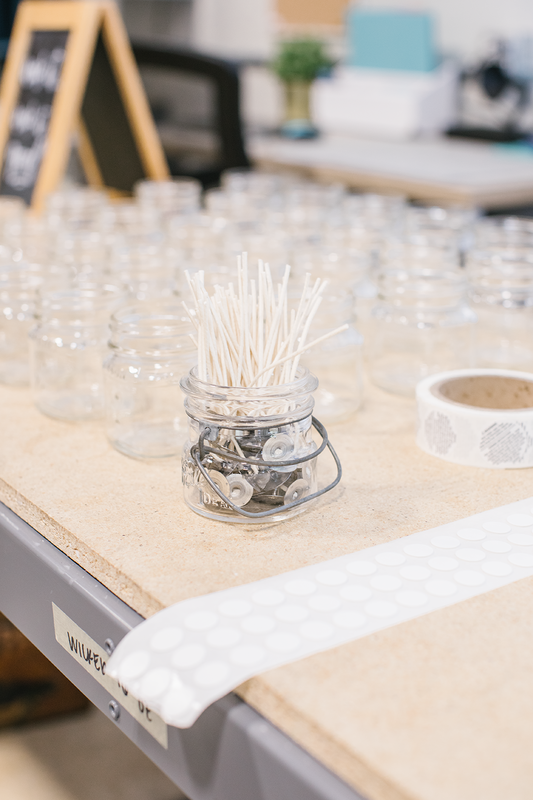 Each and every candle is carefully hand poured, wicked, and packaged. 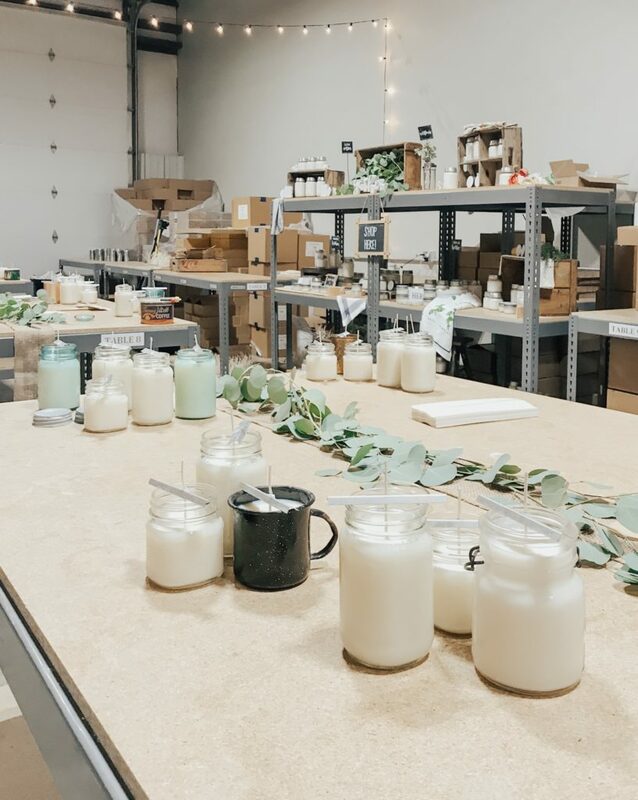 Every candle is basically passed from one person to another on the team until it’s packed up and shipped out to customers like you and me. It was really awesome to see the process and all that goes into making each candle. It’s definitely a labor of love! Anyway, after the tour we all had our own little work stations and I even got to pour my own candle! The day ended with a group dinner, where we all enjoyed yummy food and good conversation. The best part was when two of the ACC team members stood up and made a speech about how this company has changed their life. Not only by providing them with full time jobs, but by giving them the opportunity to work in a job they truly love and enjoy. You guys, it was SO moving. Everyone was teary eyed by the end! And it was a good reminder of the huge impact you make on people’s lives when you support small shops. 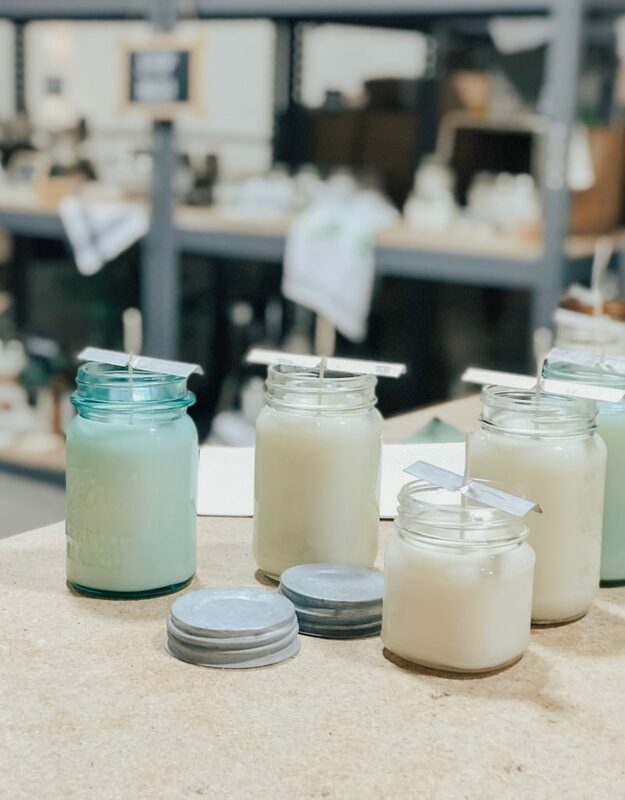 I know many of you love Antique Candle Co as much as I do, so I hope you enjoyed seeing these photos of their shop and learning a bit more about how the candles are made. 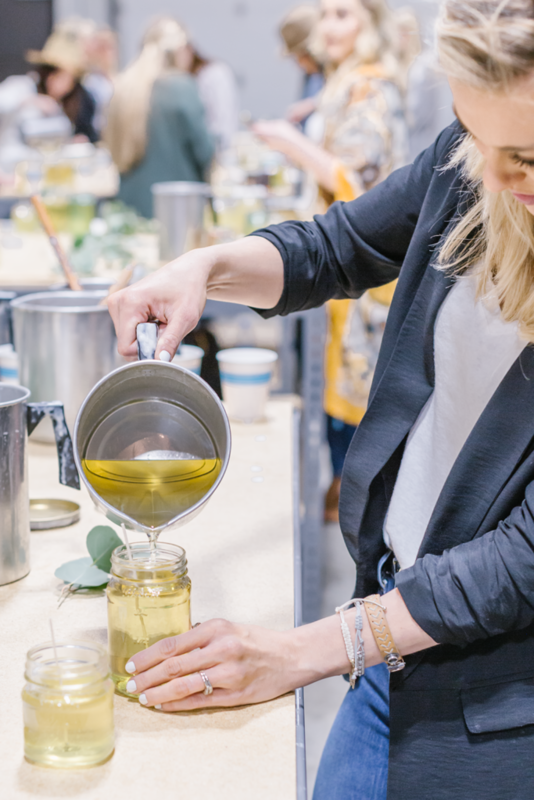 I loved meeting the sweet people that create these candles every day and I have to say–it feels really good to know who you’re supporting when you shop small. This entire company is just sweet as pie and I’m honored to share their work. Plus their candles are THE best, so it’s a pretty great combo. I can’t wait to see what the future holds for this company! I love, love, love candles and my daughters have the same love. When will we see these candles in Ottawa, Canada? I’m not sure Sharron, but I hope soon! Thank you so much for sharing the company of the candles. I will buy some of these when I get to the US. Dying to smell them. The Drew Barrymore items are beautiful. I love The Settee in pink flowers. I am 62. Not on social media. I do read your IG feed, and look forward to your blogs, 3 days a week. Diagnosed with blood cancer on November 6 (Election Day, no less, and still made it to the polls). And diagnosed with HSP (Hereditary Spastic Paraplegia) January 30. To say life has been tough is an understatement, but you lift me up in ways I can’t describe. Please don’t stop being you. Bringing me joy, being your beautiful self, inside and out. 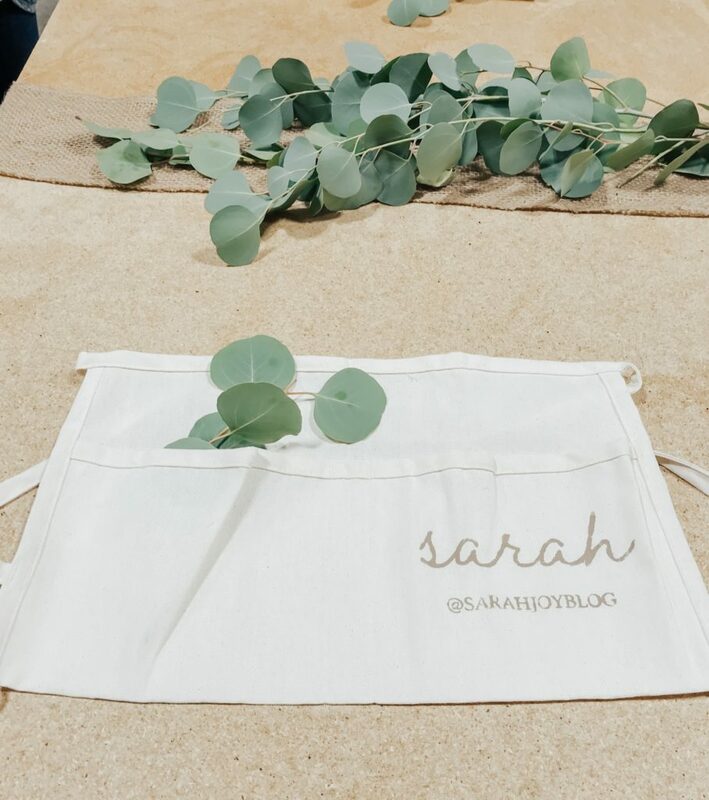 (You are beautiful, Sarah🤗) and just posting all the things I love, farmhouse and otherwise. Blessings to you and yours 😊❤️ Please don’t stop doing what you’re doing. I honestly mean that. Thank you Shelia, you are so sweet! I’m so glad I got out of my comfort zone and went too. It was so fun! And I agree with you–small businesses are what make this country what it is! Ah thank you Melissa!! It’s been so amazing to watch her company grow so much over the past few years. I am a mother of a 3.5 yr old girl and an 8 month old boy. I get approximately 10 minutes to myself in which I scroll quickly through many junk emails to get to this happy place !!!! !😁Your blog is great. I love your style. I am looking forward to purchasing some candles asap. 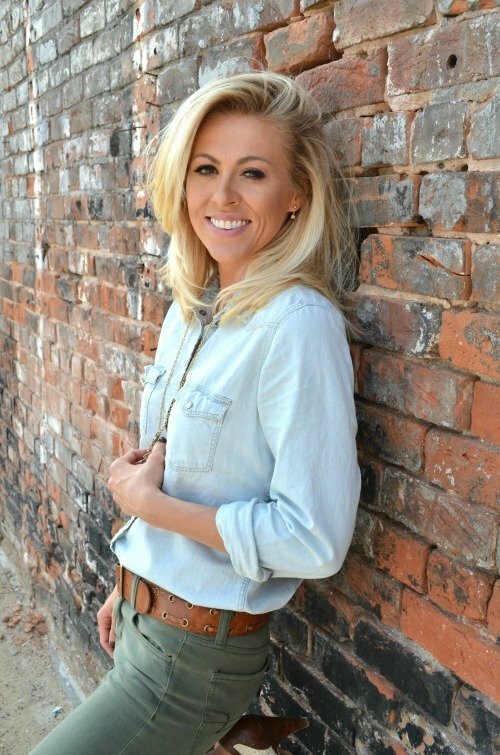 Mother of three yourself, you rock!! I love these candles! Saw them on one of your posts and checked them out. When I burn them in my home it smells wonderful. Hoping to become a tester of new candles, but we’ll see. Thanks for giving us a glimpse of their shop and how they are made. aren’t they just the best, Brenda?! They’re the only candles I burn these days. I am enjoying my candles too and so glad you shared and I am hooked on them now too. oh yay, that makes me happy Debbie!! Hey Sarah, I recently started following your channel, and you’ve been giving me a ton of ideas! Thanks! P.s your images are amazing. Ah yay! Thanks for being here. Cheers!